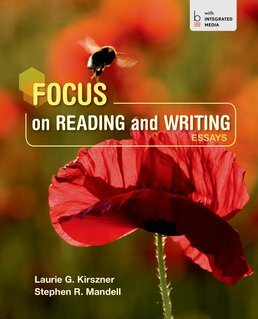 Utilizing several effective features to help students make the connection between the reading and writing processes, Focus on Reading and Writing includes a simple and effective reading and writing tool designed to help students gauge their progress. Each chapter gets you reading and writing from the start. After learning essential concepts, you're ablke to apply them as you re-read and revise your essay. Richard Rodriguez, "Around the World, Women Are on the Move"
Lynda Barry, "The Sanctuary of School"
Julia Angwin, "How Facebook is Making Friending Obsolete"
Steven Conn, "The Twin Revolutions of Lincoln and Darwin"
Mary Sherry, "In Praise of the F Word"
Rachel Carson, "A Fable for Tomorrow"
Amy Ma, "My Grandmother’s Dumpling"
Scott Russell Sanders, "The Men We Carry in Our Minds"
Richard Lederer, "The Case for Short Words"
Richard Wright, "The Library Card"
Joshuah Bearman, "My Half-Baked Bubble"
Adam Goodheart, "How to Mummify a Pharaoh"
Carolyn Foster Segal, "The Dog Ate My Flashdrive, and Other Tales of Woe"
John Gray, "Men Are from Mars, Women Are from Venus"
Judy Brady, "I Want a Wife"
D. B. Grady, "Why Women Soldiers Don’t Belong on the Front Lines"
John Edgar Wideman, "The Seat Not Taken"
Bob Herbert, "Tweet Less, Kiss More"
Adam Winkler, "The Guns of Academe"